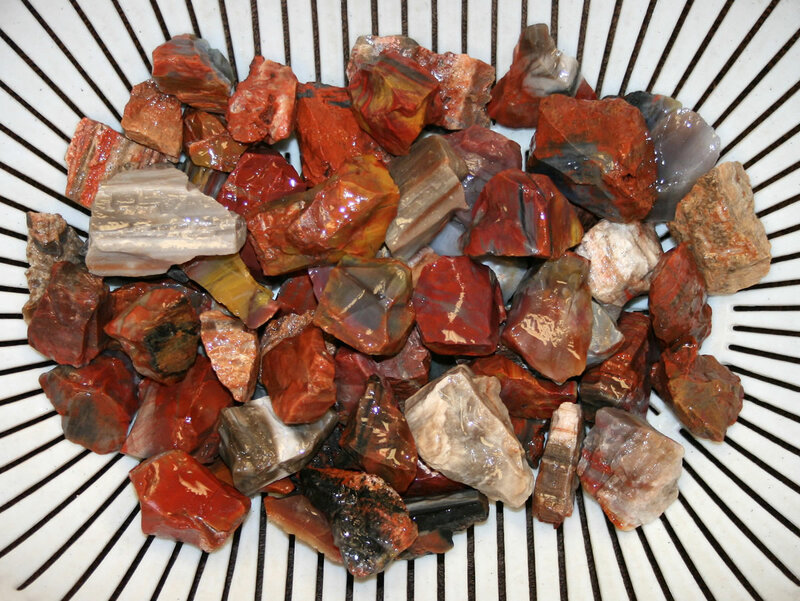 This image shows a 3-pound bag of Arizona petrified wood tumbling rough, dumped into a colander and sprayed with water to reveal its full color. Click on the image for a larger view. Wow! What beautiful color! Petrified wood is found in hundreds of locations around the world, but the best-known and most popular locality is Arizona. Some of the world's most brightly-colored petrified wood is found there. Unfortunately much of the petrified wood found there is not suitable for rock tumbling because it contains lots of pore spaces and voids. We were lucky to obtain a small amount of well-silicified Arizona petrified wood with lots of red, brown, orange, yellow, white and gray color. It works great in a rock tumbler. Here are some pieces of our rough Arizona petrified wood that were tumbled using the Rock Tumbling Recipe below. 1) More Time: Although this petrified wood is a little softer than most agates and shapes nicely, it will require more time in coarse grit than beginner's tumbling roughs. In six, twelve and fifteen pound capacity barrels two weeks might be enough to shape the rough to your satisfaction. However, in small tumblers of two or three pounds capacity, three or four weeks is often needed. We suggest tumbling this petrified wood in coarse grit for two weeks, clean the rough and the barrel, then run another week or two in coarse grit unless you are happy with the shape. If you are happy with the shape, move on to medium grit. Coarse Grit Step: Fill your tumbler barrel 2/3 full of rough and media (we use about 25% media and 75% rough). Then add 2 tablespoons of coarse (60/90) grit per pound of material in the barrel. Add enough water to cover the tops of the rocks. Run the material in coarse grit for 2 weeks. After two weeks check your material. If you are happy with the shaping move onto the medium grit step. If more shaping is needed, clean the rough and start tumbling again with a clean barrel and fresh grit.